Texas Coin Salesman Sentenced To 3 Years In Prison | The Voss Law Firm, P.C. WILMINGTON, Del. — Delaware's attorney general says a Texas man has been sentenced to three years in prison for his role in a scam involving rare coins. 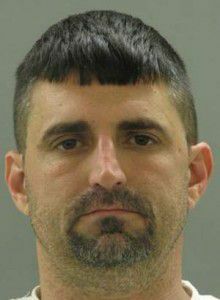 Marcus Meehan was charged with selling coins in 2008 to a quadriplegic senior citizen in Delaware at a significantly inflated price. In addition to his three-year sentence, Meehan was also ordered to repay $200,000 in restitution. Attorney General Beau Biden announced the sentence on Tuesday. Prosecutors say that the 40-year-old from Buna admitted that the coins were worth only 15 percent of what the investor paid. Meehan was indicted in April and later pleaded guilty to one count of theft over $100,000. Meehan was working for a Texas company called American Eagle Reserve at the time he sold the coins to the Delaware investor. With the market in a tailspin, gold is UP! UP! Way UP! Just don’t ever buy from this guy. This guy is gonna love prison (or we should say, prisoners are gonna love him — and his cute little hair do). His investment advice? Not so much. Marcus Meehan, a 40-year-old Buna man, was sentenced in a Delaware court yesterday to three years behind bars, four years of intensive probation and ordered to pay $200,000 in restitution for his roll in a Southeast Texas rare coin scam. And his victim: He swiped hundreds of thousands of dollars from a paralyzed gentleman who was able to speak using only the assistance of a computer. In 2008, while working for American Eagle Reserve in Port Arthur, Texas, Meehan communicated with a quadriplegic senior citizen in Delaware who was only able to communicate with computer assistance and gained his trust in order to sell him coins. So instead of paying for his own health care, this paralyzed man sent Meehan money for coins that weren’t worth the metal they went pressed on. Meehan, who told the court he was taught “how to lie, manipulate and pray with clients over the phone in order to gain their trust,” said the coin’s worth was inflated by up to 15%. Irony…meet Mr. Meehan. Mr. Meehan…this is irony. Now if you’ll excuse us, we’re off to buy some gold.